Because these teams met at the Ice Breaker, Miami and Providence will face each other a total of three times this regular season. The Friars blanked the RedHawks, 4-0 the second week of the season in Erie and have dominated Miami in recent history, going 7-1-2 in the last 10 matchups. These will be the first regular season contests for the RedHawks in 34 days, and MU has not recorded a win since Nov. 17.
WHO: No. 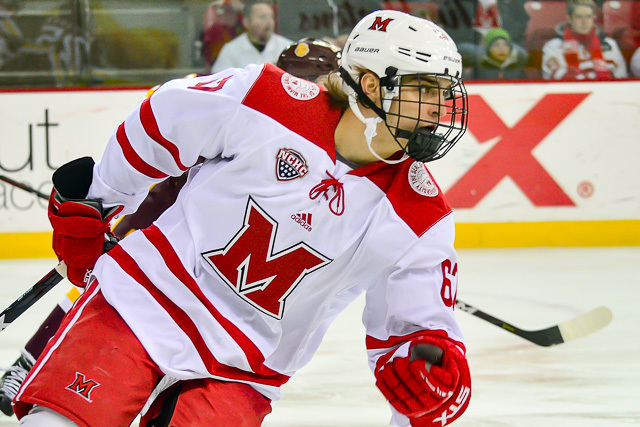 16 Miami RedHawks (9-6-3) at No. 10 Providence Friars (11-4-3). WHERE: Schneider Arena (3,030), Providence, R.I.
PROVIDENCE RADIO: WHJJ-FM (104.7), Providence, R.I.
NOTES: Providence is No. 10 in the NCAA in scoring and fourth in defense. The Friars have won four straight games and are unbeaten in their last six. And they’ve already dominated Miami once on neutral ice. So the RedHawks face the difficult task of opening the second half on the home ice of a team that has lost just one of its last 10 meetings with Miami. Providence averages 3.61 goals per game and has six forwards and a pair of defensemen with at least 10 points. Up front, Josh Wilkins has six goals and leads the team with 15 assists and 21 points, and he is 4-10-14 during his current eight-game points streak. Six-feet, two-inch freshman Jay Dugan is second in scoring with 19 points, including seven goals. Las Vegas drafted him in the fifth round in 2018. Pittsburgh Penguins second-rounder Kasper Bjorkqvist leads the team in goals with nine, including four on the power play, and he has 18 points overall. Brandon Duhaime and Scott Conway have been major contributors among the forward corps as well, posting 16 points and seven goals, respectively. Jacob Bryson leads Providence blueliners in points with 14, including three goals, and Spenser Young has six goals – with a team-best five on the man advantage – from the back end. Young picked up two of those tallies vs. the RedHawks in October. Defensemen Vincent Desharnais, Ben Mirageas and Michael Callahan all have identical 1-5-6 lines, and along with Davis Bunz, Friars blueliners have helped hold opponents to just 22.7 shots per game. Montreal draftee Hayden Hawkey has been in net for 17 of Providence’s first 18 games, logging 1,022 minutes and racking up 11 wins. He has a goals-against average of 1.88 and owns a .916 save percentage. The Friars have outscored opponents, 65-34 this season and have allowed just five goals in their last five games. Both Phil Knies and Ryan Larkin played in Miami’s exhibition on Sunday and looked 100 percent, so they should be in the lineup this weekend, giving the team a major boost. 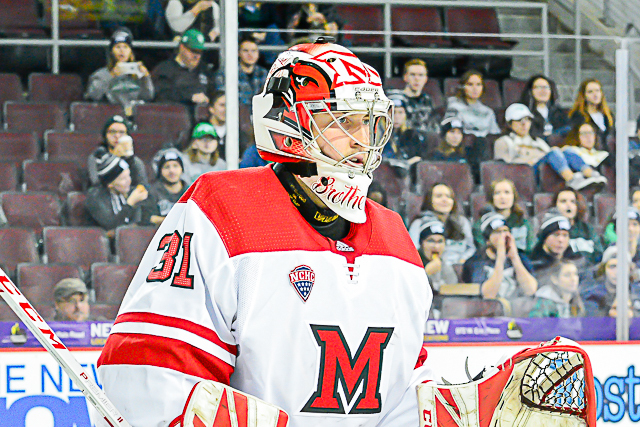 Knies had missed six games with an upper-body injury and Larkin was knocked out of the RedHawks’ opener vs. St. Cloud State on Nov. 30 and did not play the following night. Josh Melnick enters this series riding a five-game points streak, during which he has a pair of markers and four assists. 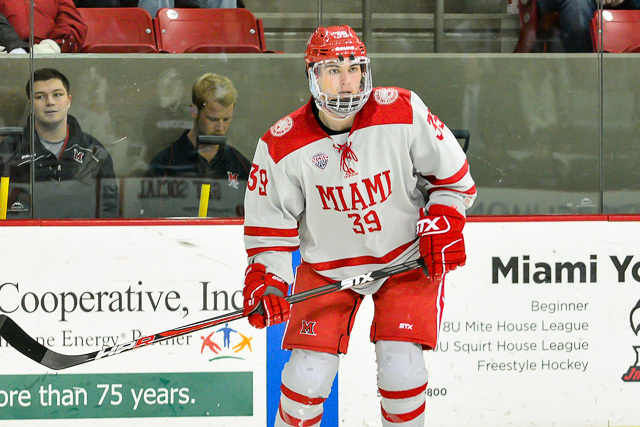 Melnick is two points away from being the 52nd Miamian to record 100 career points. Casey Gilling has been MU’s best goal threat since mid-November, scoring four times in his last seven contests. Despite its recent struggles vs. Providence, Miami did win its last game at Schneider Arena, 3-1 on Oct. 8, 2016. And MU was excellent in the first 10 minutes of its initial meeting with the PC three months ago, but a couple of soft goals for the Friars swung the momentum hard in their favor. The RedHawks are 2-3-1 all-time on the Friars’ home ice. These teams have not met since New Hampshire knocked Miami out of the 2011 NCAA Tournament and have only faced each other 12 times in their history. The RedHawks’ first-ever NCAA Tournament win came against the Wildcats in 2007. MU has logged four previous games in Durham, and after losing the first two came away with a win and a tie their last trip here in 2010-11, coincidentally the same season the RedHawks lost to UNH in the regional semifinal. WHO: No. 19 Miami RedHawks (9-5) at New Hampshire Wildcats (1-6-3). WHERE: Whittemore Center (6,501), Durham, N.H. WHEN: Friday and Saturday – 7 p.m. ALL-TIME SERIES: New Hampshire leads, 6-5-1. LAST MEETING: New Hampshire won, 3-1 in a first-round 2011 NCAA Tournament game. NEW HAMPSHIRE RADIO: WGIR-AM (610), Binghamton, N.H.; WQSO-FM (96.7), Portsmouth, N.H.; WPKX-AM (930), Rochester, N.H.
NOTES: New Hampshire’s record may look dismal but this team has been competitive in nine of its 10 games. Four have gone to overtime with two of those being decided in an extra session – including the Wildcats’ long win – and another four were decided by one goal in regulation. Scoring has been UNH’s main issue. The team has found the net just 20 times or 2.00 per game and the Wildcats’ team shooting percentage is 7.7. New Hampshire has yet to record more than three goals in a game this season. Odd stat: The top two points producers on the Wildcats have just one goal each. Forward Charlie Kelleher and defenseman and Florida Panthers’ draftee Max Gildon has twin 1-9-10 lines. Jackson Pearce has four goals and four assists, and Ara Nazarian leads the team in markers with five despite missing two games. Nazarian has scored in four straight contests. Marcus Vela (3-2-5), a San Jose draftee, is the only other UNH skater with at least five points. The Wildcats’ other NHL draft picks are F Angus Crookshank, F Benton Maass (Washington) and goalies Mike Robinson (San Jose) and Ty Taylor (Tampa Bay). Robinson is the favorite to start both games, since he leads the team in goals-against average (2.62) and save percentage (.911). He has played in eight of UNH’s 10 contests. 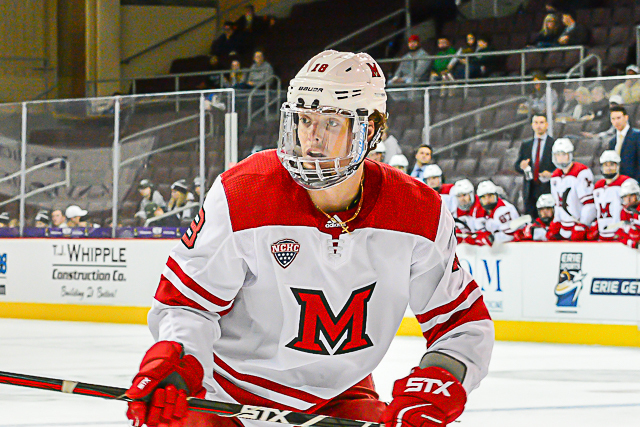 For the RedHawks, Casey Gilling enters this weekend with five points in his last three games, including a pair of goals. Josh Melnick has 11 in eight. 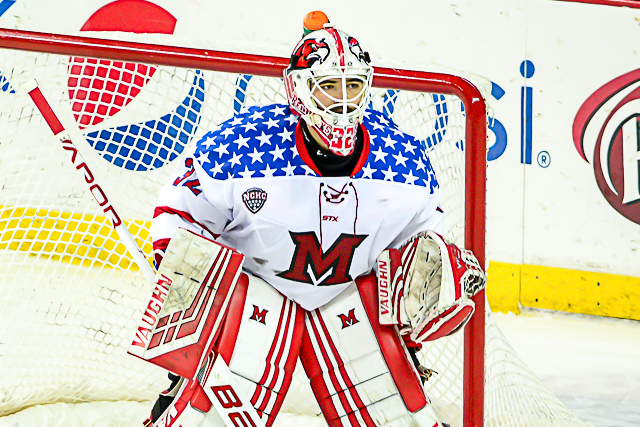 Ryan Larkin has been in net for nine straight MU contests. Miami has played just four road games this season and are 2-2 with weekend splits vs. Nebraska-Omaha and Colorado College. This is the second-last non-conference series for the RedHawks, who will travel to Providence in January. According the UNH’s site, these games will be televised on YouTube. Showing technological naivety here but didn’t realize that was a thing. OXFORD, Ohio – Not only did Casey Gilling score the goal that put No. 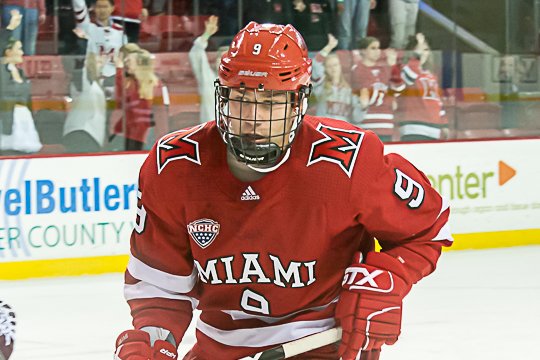 19 Miami ahead for good, he assisted on the other two RedHawks tallies. The sophomore’s three-point night powered MU to a 3-2 win over the No. 11 Fighting Hawks at Cady Arena on Saturday as the teams split their two-game weekend series. Miami (8-4) snapped a two-game skid and ended UND’s winning streak at five. RECAP: With 6:01 left in the first period, Gilling fired a shot from the right wing that hit off a skate and caromed to Josh Melnick at the left faceoff circle, and Melnick roofed it to give the RedHawks the early lead. The Fighting Hawks’ Jordan Kawaguchi tied it when he took a one-time pass from Jasper Weatherby and whipped it past Miami goalie Ryan Larkin from the right faceoff circle just 3:38 into the third period. That goal came seconds after Larkin had made a highlight-reel stop on a one-timer from the slot. The RedHawks took the lead for good when Gilling deflected a blue line wrister from Derek Daschke with 10:23 left in regulation, giving MU a 2-1 lead. Gilling fired a pass to Karch Bachman on the left wing, and Bachman blew past the defense and fired a shot under UND goalie Adam Scheel with 3:40 remaining, extending Miami’s lead to two. The Fighting Hawks (5-3-1) cut the deficit to one with 22 seconds left as a wrister by Matt Kiersted hit Miami’s Brayden Crowder and bounced to Kawaguchi for his second goal of the night. Kawaguchi had not previously scored this season. STATS: Gilling’s three points ties a career high and he earned two assists for the first time in his career. It was the third goal in six games for Melnick, and Bachman found the net for the first time in eight contests. Larkin stopped a season-high 35 shots, as he made over 30 saves for just the second time in 2018-19. THOUGHTS: Miami came out flat to start Friday but did not have that issue in this game. 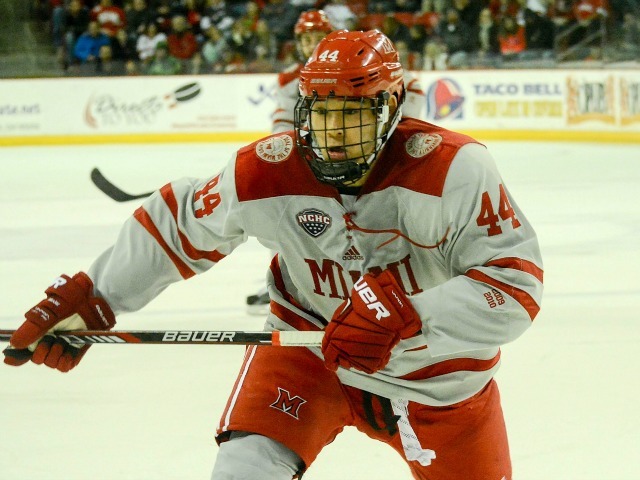 The RedHawks earned this win against one of college hockey’s flagship programs during a supposed rebuilding year. This is the biggest quality victory for Miami this season, which has seen MU beat a lot of downtrodden teams. — And the crowds are coming back. This was the best of 2018-19 in terms of numbers and intensity, and UND’s vocal contingent helped build this rivalry. Miami’s so-called rebuild for this season seems to be happening more quickly than anticipated. — Phil Knies was injured on a hit along the boards, and he may miss some games to a resulting upper-body injury. FORWARDS: B. Much better puck possession by this corps than Friday, when UND put on a clinic. We mention the top guys all the time, but Zach LaValle has really stood out in his opportunities. River Rymsha jumped up from the blue line to anchor the Melnick-Gordie Green line. DEFENSEMEN: C+. North Dakota generated a lot of scoring chances against the defense corps, not surprising considering the Fighting Hawks’ resume. With Knies being injured, Brayden Crowder and Andrew Sinard played together for a 13-feet, 1-inch pairing, and both stood out. Crowder made multiple key defensive plays with his stick and Sinard used his backside to impede opponents and shut down a UND breakaway with his backchecking. GOALTENDING: A-. Larkin stopped 36 shots, and the the two goals he allowed were on a cross-crease one-timer and a fluky bounce off a blocked shot. Seconds prior to the first UND goal Larkin flashed the pad on a 2-on-1 for his best save of the season. LINEUP CHANGES: LaValle was back in up front and Sinard was in the lineup as the extra skater. F Carter Johnson and D Chaz Switzer did not dress. FINAL THOUGHTS: Miami has played one-third of its games and has a record of 8-4. Yes, the team schedule hasn’t been as strong but any sane person would’ve taken a .667 winning percentage to this point if asked about it prior to the season. 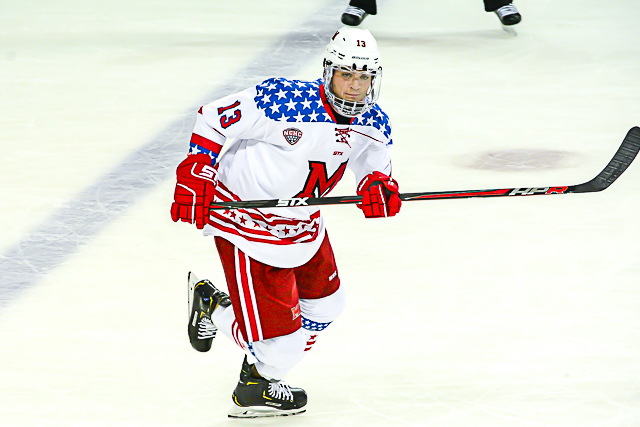 Miami has also brought its recently-dormant crowd back into the mix, giving it another advantage as the RedHawks enter the crux of their schedule. Denver had three power play chances in the first period and scored on two of them. 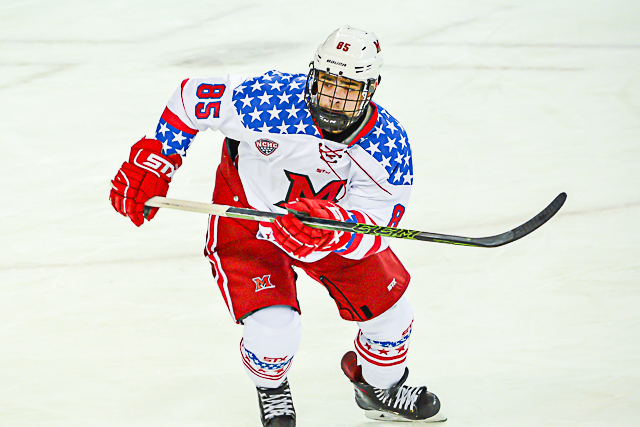 The Pioneers added another goal early in the second period for a three-goal lead it would not relinquish in Friday’s 6-3 DU win over Miami at Magnuss Arena. The RedHawks (11-18-4) did pull to within a goal in the closing minutes but No. 5 Denver punched in a pair of late markers to seal the win. Miami has lost 10 straight March games and is 0-9 in this month the past three seasons. The RedHawks are 0-7-1 on the road since their last victory outside of Oxford on Dec. 8, and they have a 2-10-2 overall record in their last 14 games. RECAP: It was the Dylan Gambrell show early. The DU forward scored on the backhand from the slot to open the scoring, and his shot from the same area was tipped in by Jarid Lukosevicius to make it 2-0. 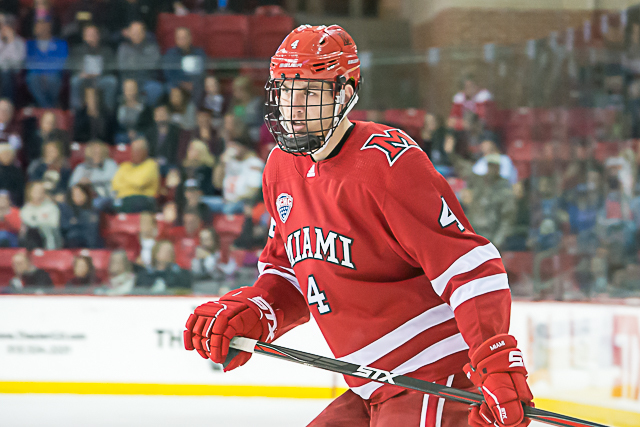 Rudy Junda extended the DU lead to three when he took a behind-the-net feed from Kolin Olischefski, was denied by Miami goalie Ryan Larkin and batted home the rebound. The RedHawks cut the deficit to two when Kiefer Sherwood knocked home a one-time pass from Phil Knies on a 3-on-1. With 10:14 left in the second period, Logan O’Connor centered a pass to Henrik Borgstrom, and the puck hit off Borgstrom’s skate and into the net, making it 4-1. 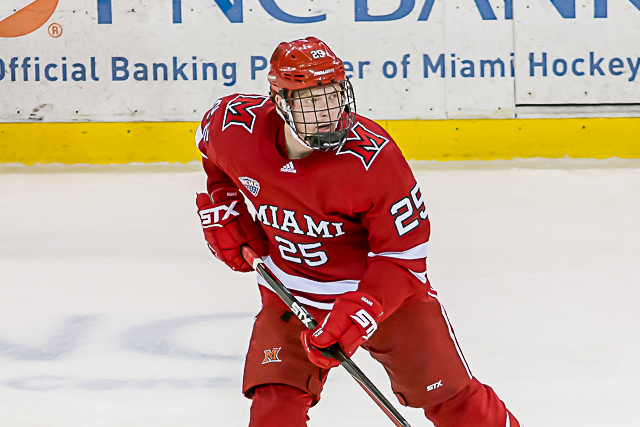 Miami trimmed the lead to two with five minutes remaining in regulation when Conor Lemirande penetrated the zone and had his pass into the slot hit a Denver player and carrom in. The RedHawks’ Casey Gilling’s feed also hit a Pioneers defender, deflecting off a stick and into the net with 3:57 remaining. But a seeing-eye shot from the blue line by Adam Plant found the cage with 2:23 left to make it 5-3, and Colin Staub capped the scoring with an empty netter. STATS: Slow starts have been the norm for Miami in recent weeks, as the team has been outscored, 9-0 in the first period its last seven games. The RedHawks also have not scored a power play goal in that seven-game span, going 0-for-22 on the man advantage. Denver (18-8-7) had five power play chances, scoring on two of them. Miami was on the man advantage once. — It was the first career multi-point game for Rourke Russell, who picked up two assists. — Sherwood has scored in consecutive games for the second time this season and has a team-best three-game points streak. — Gilling scored for the first time in seven games. Lemirande had not scored in his last 25 contests. THOUGHTS: Did we mention the early power play goals for Denver? An opponent just can’t give the Pioneers three chances in the first period and expect to win, especially on their home ice. Then it was 3-0, and that pretty much sealed Miami’s fate for the night. To the RedHawks’ credit, they battled until the end, trimming a 4-1 Denver lead to one before ultimately surrendering a fifth goal followed by an empty netter. Being an early no-show has been a theme for Miami this season and is a tough way to make a living in the ultra-competitive NCHC. — Both early goals were scored because Denver was allowed to control the slot. Gambrell skated laterally to get in there for his goal, and he did the same from the opposite direction on goal No. 2, which was tipped in by Lukosevicius – a player allowed to camp out at the top of the crease. — It was a strange night for redirected pucks. Miami had one go in off a skate and another hit a stick, as both completely changed direction en route to the net. One could argue the RedHawks got somewhat lucky in getting back into the game, since those consecutive goals took the score from 4-1 to 4-3. To be fair, Denver also scored one – its fourth of the night – when a centering feed hit Borgstrom’s skate before finding its mark. LINEUP CHANGES: Up front, Christian Mohs dressed for just the eighth time this year, and Zach LaValle was in the lineup for only the second time in eight contests. Carson Meyer was the notable scratch, as the Columbus Blue Jackets draftee has struggled this season. It’s the second time he has not played this season. Willie Knierim was also out of the lineup. FINAL THOUGHTS: Officially these games mean nothing for Miami, which has one clear route to the NCAA Tournament: Beat St. 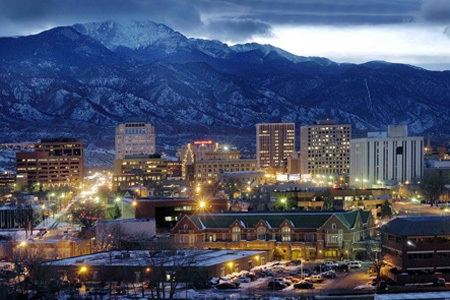 Cloud next week and win the NCHC Tournament. But it would’ve been nice if there were more positives to be taken from this game. The RedHawks did battle after falling behind by three, which is admirable in an essentially meaningless game, and Sherwood continues to shine after a sub-par first half. That’s the boom from this one. The negatives: Opponents didn’t pay a price in the slot – a recurring theme – the team got off to a slow start, etc. Ideally, it would be nice to have momentum heading into the opening round of the conference tournament. Denver and SCSU are the elite of the elite in this conference, and Miami needs to show it can compete on the road against Division I’s best. Unfortunately, this game did little to inspire confidence.